Rhiannon is the story of a lady that is from another world ~ called the Bright world ~ and she leaves her kingdom to become the wife of a king ~ a mortal king ~ but goddesses really can't marry mortal kings, if they do they lose their powers ~ their magic powers. And they don't lose the knowledge of them they just ~they know everything that's going to happen they just can'tdo anything about it. Which is a much more difficult way to live than not having magic powers is to not be able to use them and know exactly what's coming and to not be able to tell anybody. So she comes down and does her whole trip, and it's just a whole story ~ it's a wonderful story. And she has these birds that sing and that is the legend of the song of the birds of Rhiannon. And they sing this song that is uh, said takes away pain and suffering and if you hear the song you just sort of blank out and go away and then when you wake up everthing's all right. And it is a wonderful, wonderful story which I use a lot, because there's a lot of ~ there seems to be a lot of need for the story of Rhiannon around lately, because if people are sad or have lost anybody or something the story really makes a lot of sense. I didn't write Rhiannon for commerciality. I wrote Rhiannon because I loved her name and I loved her story. I didn't write her to be sold, she simply is not for sale and has never been. I got the name from a novel, I think I bought in an airport just before a long flight; it was called Triad, and it was about a girl named Rhiannon and her sister and mother, or something like that. I just thought the name was so pretty that I wanted to write something about a girl named Rhiannon. 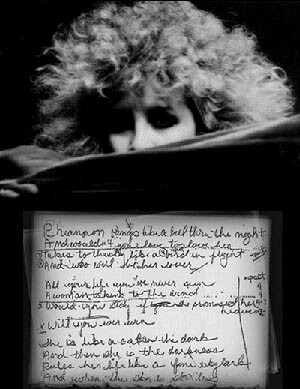 I wrote it about three months before I joined Fleetwood Mac, in about 1974. And then to find out that Rhiannon was a real mythical character! I went and read the four books of Rhiannon, and visited the lady who'd translated them. 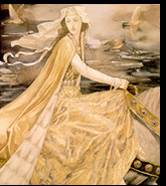 Rhiannon is the maker of birds, and the goddess of steeds; she's the protector of horses. Her music is like a pain pill. When you wake up and hear her birds singing her little song, the danger will have passed. I realized that somehow I had managed to pen a song that went very much along with the mythical tale of Rhiannon. That's when everybody started saying Stevie must be a black witch or something. Rhiannon was a queen in a world far above us called the bright world, where all the colors were brighter, and everyone had a special sort of glow around them. It was a beautiful world, and she loved her world, but she fell in love with a mortal king from OUR world...and she left her world to come to ours to be with him. Rhiannon had three birds, one white, one emerald green, and one golden. It is said that in time of war, or strife, or pain, that her song can be heard. "And down the glorious pathway, came the three singing birds, straight into the middle of the trouble and hardship ..." but that when you heard her song, your eyes would softly close and you would slip away. When you awoke the trouble would be gone, the sky would be the most wondrous blue, and far in the back of your mind you would hear that little song,, like a delicate little music box. If you were lucky, you might even see the three beautiful birds slowly flying away from you, and if you were very very lucky, you might even see Rhiannon .... slowly turning around to you to say, everything is fine,- She is smiling, and you see her disappear into the fine white clouds. It is said that the legend is true...so I send you the energy from my golden cross and the three singing birds of Rhiannon to comfort you and to keep you safe. .